We are the nation’s largest paragliding and speed flying facility. We teach lessons 7 days a week (year-round, even in our snowy Utah winters), we boast a complete repair loft and are the US importers for most major brands of paragliding equipment, supplying over 50 flying schools across the USA. 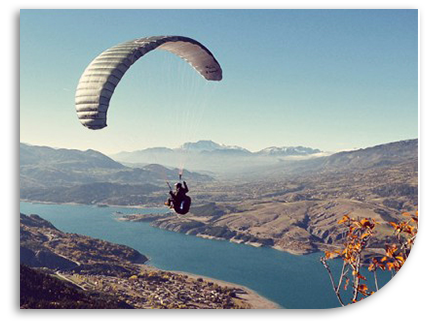 We employ several of the finest Paragliding instrcutors full time. This means we can teach ever flyable day of the year. The world famous Point of the Mountain gives us over 200+ flyable days a year. If you want to do all your training from ground zero to rated P2 pilot in the most efficient way Cloud 9 in Utah is for you! We love teaching and sharing free flight with all of you. In essence, though, Cloud 9 is really just a big toy store. In addition to an encyclopedic inventory of paragliding gear, we have tons of other random stuff that’s sure to make anyone smile. We stock HD GoPro helmet cameras, Electric Bike, Snow and Kitesurfing Gear, Inflatable Stand-up Paddleboards, Kids’ Kites, Segways, Slacklines, Mountain Unicycles… the list goes on and on. Basically, if we have fun doing it–it’s here. Our Shop is Awesome! Really. We love it when people come over to hang out and try a new toy. We’re open online 24/7, but come visit in person–we’re open 10am to 4pm Mountain Time every day but Sunday, unless we are at the hill flying!